Yesterday was Severe ME Day. While the normal ME awareness stuff happens in May, today is about the 25% of patients at the severe end (though even mild ME has a massive effect on someone’s life). This blog post is late because I ended up sleeping most of the day. I previously wrote about what ME is in 2012. I’ve had ME for nearly 9 years now. I’m not sure exactly when it became severe: I became unable to walk completely in January 2011, and by August that year I could only manage 10 minutes sitting upright before getting severe symptoms, so probably about 8 years ago. There’s different levels of severe, and I have bounced around there since then. It probably didn’t help that I had POTS already and that I had moderate ME from the start (mine was triggered by swine flu that never got better). At this point, I’m ~99% bedbound. By that, I mean I am doing well if I get hoisted into my wheelchair once or twice a month. 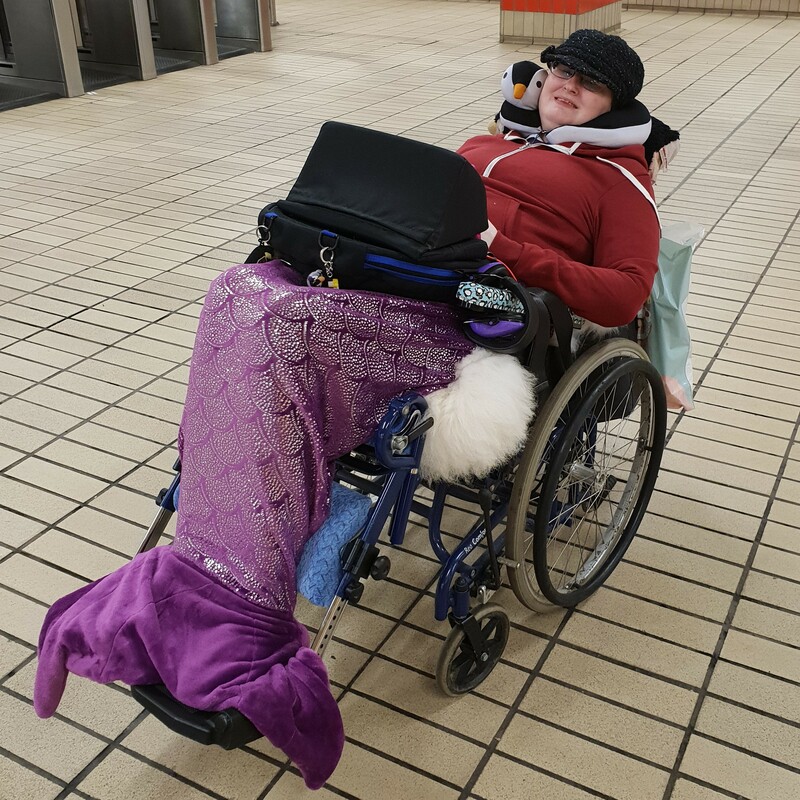 I’m lucky that on those days I often can get out, as my wheelchair tilts and reclines so I’m more lying down than sitting up. I also have a husband who is both strong and stubborn, and willing to push me even though there’s a lot of hills around here 😛 I consider myself at the higher end of severe most of the time. I basically need 24 hour care. My hands don’t work properly (they shake and spasm a lot, especially when trying to hold things) so rely on other people to help me with things like drinks (I mostly use bottles with tubes as I can’t lift a cup), making and cutting up my food, as cutlery and my hands tend not to get on and I’m stubborn and want to feed myself, changing my incontinence pads (as I’m doubly incontinent), managing and helping me with medication, washing and dressing me, brushing my teeth, heating my penguins for pain relief, picking up the many items I manage to knock on the floor, rearranging my cushions and bedding, and all the other little things that need doing each day. I also have no sleeping pattern so I can need help at any time of the day or night. I have three daily calls from a care agency but the rest falls to Johan. The only reason I can be left alone while Johan is out is because of technology: so long as I can still type on my tablet, I can ask Johan to get back home quickly, or he will contact the care agency to send their on call person (we’ve yet to need this but the option means Johan can go more than 20 minutes away). If he’s away overnight, I need someone to stay with me or go into a care home (like when he went to Sweden for a couple of weeks). Danni on a normal day. Purple light is normal on those days as it’s not as bright as white, and is my favourite colour. On my more normal days I tend to sleep or doze more, so Johan just needs to be able to contactable as I tend not to get myself into too much trouble when asleep 😛 It’s not unusual for me to sleep for 12-16 hours, and when I am awake I use my tablet to communicate/entertain myself. Johan prefers going out for his longer runs when I’m asleep as he worries less then and he’s less likely to get an urgent message to come home (though sometimes I wake up and it happens anyway). I can usually manage low levels of light and sound with my curtain up and ear plugs in. Moving, beyond rolling over every so often to prevent bed sores, is a bad idea. Danni on a bad day (I tend not to have photos taken on bad days. The white thing is a sick bag). On my bad days, I can’t really move at all. I also struggle to chew and swallow, can develop a high temperature and often vomit despite my antiemetics. All my other symptoms get much worse as well, and sometimes my body decides that full body spasms should happen. This means I need someone to help move me every couple of hours to prevent bed sores, can only drink liquids, and pad changes and other personal care must be kept to a complete minimum (as even having my teeth brushed is torture). Any kind of noise or vibration is too much to cope with, so Johan has to move very quietly, can’t run the washing machine, and for him to shower he needs to make sure I have ear plugs, ear defenders and close all doors, and it still is horrible. My smell sensitivity also gets a lot worse, so he can’t have any food that is smelly like curry. Those days he has to stay in, as before I’ve ended up unable to swallow and at that point I need hospital, as though it’s the worst place for someone with severe ME drinking and medication are needed. 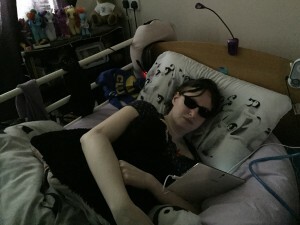 As I often can’t speak I use my tablet if I can move and manage the light with my sunglasses on, gestures if I can’t but can move my hands, and answer yes/no questions through head movements or heavy breathing when completely paralysed. Bad days are usually caused by doing too much, whether that’s physically (moving too much, trying to sit up for too long, travelling when not well enough), cognitively (usually talking to someone for too long, or trying to concentrate to fill in a form or for an appointment) or because of sensory overload, such as loud noises like alarms (or the care call noise), neighbours arguing and banging, a care worker wearing strong perfume or similar. I try to avoid them as much as possible, and they can last from a day or two to months. I consider myself very lucky. I have Johan, who is the most amazing carer and just an awesome husband. 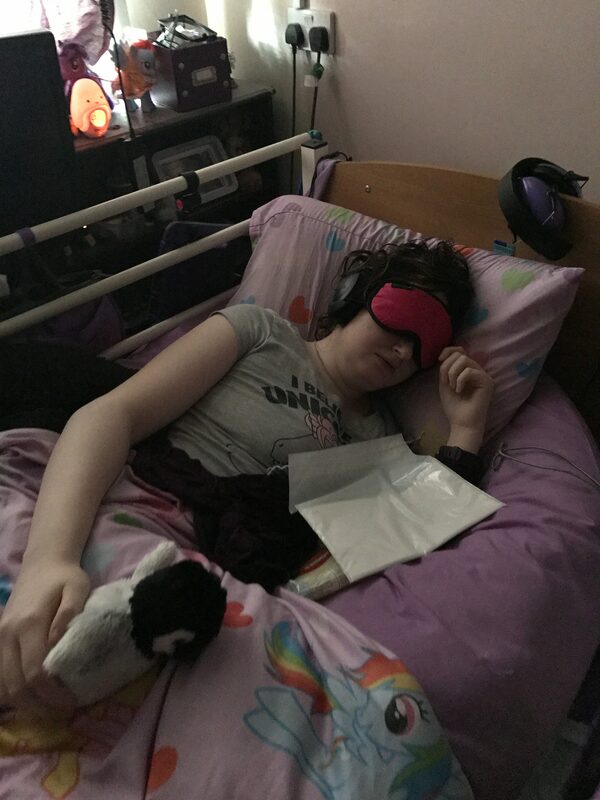 I have a pretty decent care agency, and most of the care workers are good and understand things, including how variable things can be (especially that there’s a decent chance I’ll be asleep for their calls). My GP, the district and practice nurses, and the CFS team (I don’t like it being called CFS but the team themselves are decent to me) all visit me at home. My medication works well enough that most days I can cope with the pain and feeling so ill. I do have good days where I can do more or even go out. 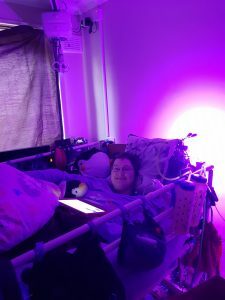 I have all sorts of awesome technology and equipment that makes things easier, from the big and expensive like the hoists, hospital bed and alternating air mattress, to the small and/or cheap like Hydrant bottles with tubes, voice or tablet controlled colour changing lights, my 12 feet U shaped cushion, and bulk bought ear plugs. We know how to manage things to reduce the amount and often the length of my relapses. For some people, my bad days are the norm or worse. They might need tube feeding, be unable to tolerate any kind of light, sound, movement or touch, and haven’t left their bed for years or decades. Some have family or medical professionals who don’t believe they’re ill or think it’s all psychosomatic. At its worse, it can result in death, from the illness itself, complications or other illnesses that were caused by, worsened or couldn’t be treated because of the ME, and sometimes suicide as understandably, some people just can’t cope. I am thinking today of all those who have or had severe ME, especially Emily Collingridge and Merryn Croft who both died from severe ME since I’ve been ill. I am thinking of all my friends who live with this illness, and that they improve soon. I am hoping that there will be better treatments and hopefully a cure for this horrible disease, which for so long hasn’t had the research and understanding it needs, and soon. The ME Association has an article for Severe ME Day, about two teenagers who live with it. It’s a decent website for finding more out about the illness as well. Press Release: Two teenagers hit by devastating severe M.E. reveal the brutal reality of life with the disease. Today is ME Awareness Day. I was hoping to record a video, but today I’m unable to speak or tolerate much light so it wouldn’t have been very good. Instead I’m writing this blog post. On Thursday I did something huge for me. 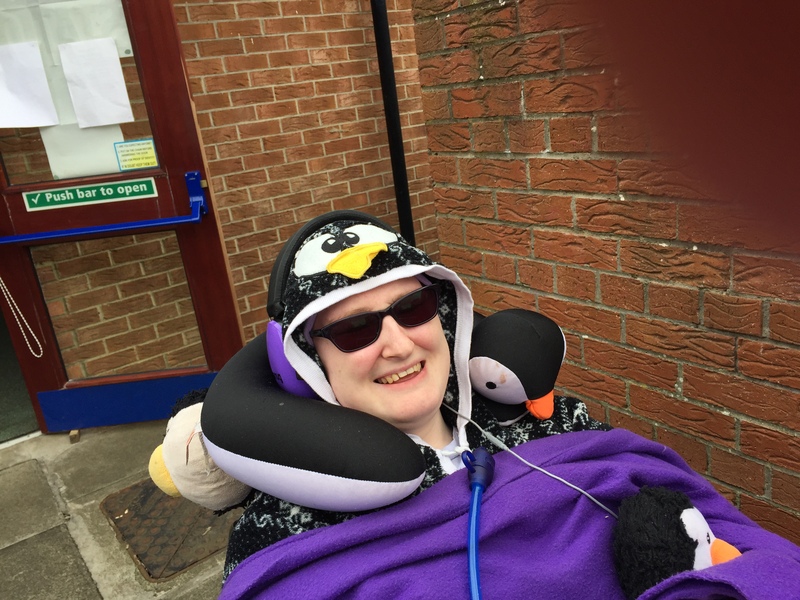 I got in my wheelchair, went out, and voted. It was the first time this year I’d been out of bed other than to go to hospital. It confirmed to me that when I get my hoist I’m well enough to spend some time in it, as the only bit that was problematic was getting back into bed. I didn’t have the strength to transfer so Johan ended up throwing me on the bed. It worked, but was painful. Over the weekend I saw friends. Rammi came up from London to stay for a few days (and see S Club 7 with Johan) and Marga and Sue visited on Saturday with their daughter and witnessed my name change (I’m now legally Danni rather than Danielle). It was awesome and I’m glad I saw them, but now I’m paying for it. Yesterday I was awake for about 5 hours in total. Hard to tell exactly as my sleep was very disrupted by nightmares and pain. Not unusual at the beginning of payback. Danni getting payback in bed. Today I woke up when the carer opened my door this morning but unfortunately I had sleep paralysis so wasn’t able to tell her I was awake. Fell back asleep she left and was woken again by drilling. I already had ear plugs in from yesterday but even with them and my ear defenders on it went right through me. Not my favourite way to be woken up. I can figure out right now. I’m lucky. Painkillers help me a little bit. I only get this level of illness if I’ve overdone it. For some people with very severe ME, this would be a good day. I have my tablet so can type to communicate and try and distract myself from how I’m feeling. I have hope that when my hoist arrives I’ll be able to get out of bed more regularly and build up my time in my wheelchair. For many, that’s not an option as they’re just too ill. Even in my good days I’m in pain, have severe muscle weakness, experience more symptoms than I care to list. Spending time in my chair sent my heart rate racing, and made me feel even more dizzy despite being fully tilted and reclined. Yet to me it was a massive achievement. I’m not scared of activity, but I’m afraid of payback as if I push too far I could relapse and become more ill than I already am. I’ve blogged before about ME. You can find some of the posts linked to above.